The current source introduced in this article is capable to handle current up to 6A with maximum input voltage of 50V. This is an operational amplifier based adjustable current source and it uses LM358 in a general voltage follower configuration. To handle large currents we use four 0.1Ω 20W resistors as “load resistor”, and those load resistors are drive through pair of 55N06 N-channel MOSFET transistors. 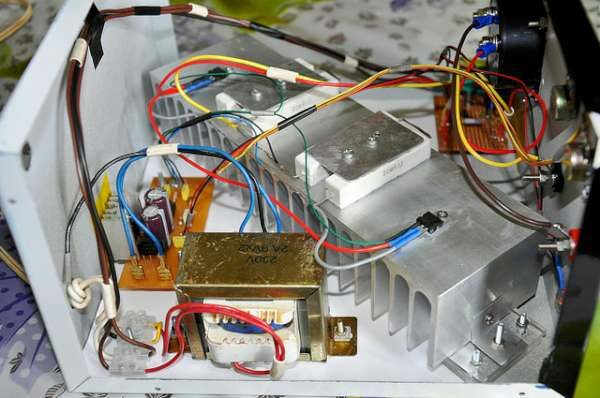 The power supply unit of this project is build around 9V x 2 (2A) step-down transformer and it is design to get regulated 12V DC voltage. In our design this 12V power source is used to drive LM358 Op-Amp and 12V cooling fan. More details at Dilshan Jayakody’s blog. Project files are available at elect.wikispaces.com. This entry was posted on Friday, May 12th, 2017 at 11:52 pm	and is filed under tools. You can follow any responses to this entry through the RSS 2.0 feed. You can skip to the end and leave a response. Pinging is currently not allowed. The pics are indicative of (yet-another) simple linear current source/load. Is the Fairchild (Now owned by On Semiconductor – until they get bought-out by someone else!) FDP55N06 a “Linear” N-channel enhancement MOSFET? I hope so.Otherwise, expect “smoke” in some situations. Plus I can not find a SPICE model for this part on the Fairchld/On-Semi site (not good). I can’t spend the time to visit Dilshan’s two sites then be faced with a .7z archive download just to see the schematic. Dilshan, please just post the schematic for us as a .jpeg. It looks like FDP55N06 is a pretty old (>10 years) part, according to the data sheet. It does not saturate that easily, so driving it in the linear region should be fine. I’m a bit concerned about short-circuit safety features. Best-case thermal performance for the FDP55N06 TO220 to heat sink is 1.1+0.5=1.6K/W per data sheet, or 78W for 125K temp differential. So two FDP55N06 may take 150W, toasty, I wouldn’t want to smell it at that load every day, ha ha. Depending on other parts of the system, if the whole thing is capable of 50V/6A max and is short-circuited by accident, then something may give way, leading to magic smoke leaking, or worse. Most power ICs or bench units have current foldback or temp trips to limit power or heat. So my interest is: It is a current source supply, but what are the safety features? If this thing is really just a current source, why didn’t the person just use a simple current mode switcher? Agree, I would rather see a project using a high-efficiency switching design. But Dilshan does a lot of old-style projects. I think I was too tied to voltage mode supplies, I should think more in terms of the power load the thing needs to shunt. That said, does anyone of you know of common uses for such a powerful current source?